Frida Restaurant Americana is a modern, upscale, full-service restaurant dedicated to serving delicious, authentic and contemporary Mexican cuisine made from the freshest, highest quality ingredients. They have created an atmosphere that surrounds you with good cheer from the moment you first step into their spacious establishment. They offer an unmatched fine-dining experience enjoying wholesome fare and savory dishes prepared by seasoned culinary artisans and served in a casual yet vibrant and festive setting. 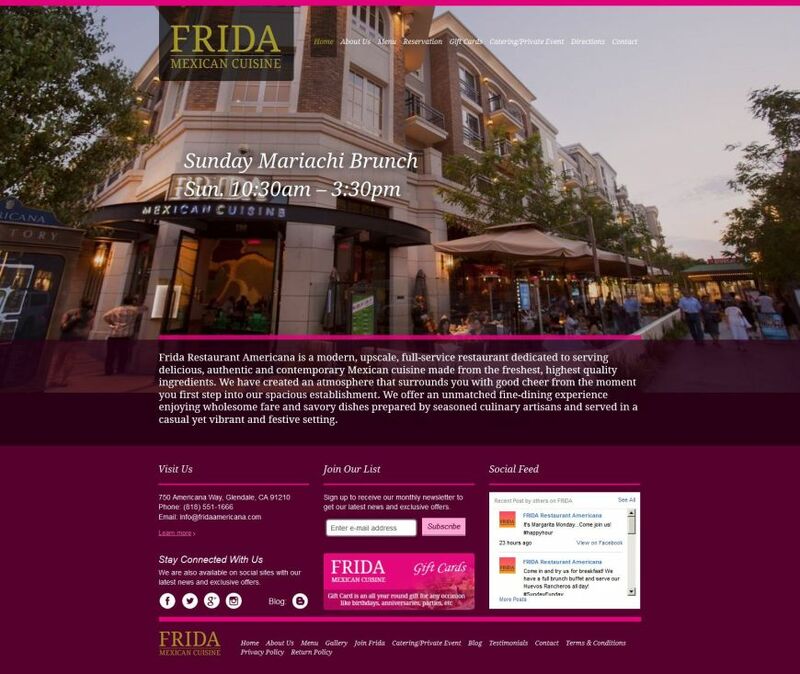 Since opening their doors in 2008, Frida Americana – which can seat up to 300 guests – has operated from our premier location at The Americana at Brand, a popular outdoor shopping community in Glendale, California. Glendale, the third largest city in Los Angeles County, is the ideal location for Frida Americana — Burbank to the north, Pasadena to the east, Hollywood to the west, and Los Angeles to the south make it an ideal home for us with easy access on all major freeways. Need: A website that not only describes the Frida experience but embodies it to give the visitor a taste of the restaurant ambiance. The system needed to work on all devices and platforms, the site features included gift cards, reservation requests and a detailed menu. Solutions: Pulse engineers selected WordPress for the web design platform due to the excellent CMS features and search engine optimization options available, a UI design was created after research into the restaurant decor, after several iterations this design was built up as a wordpress theme and tested to be fully responsive and compatible with all popular browsers.